I always think it’s great when people get extra grumpy according to the situation. However, I’ve never considered killing someone as the alternative… well, maybe. And, yeah, the twins are supposed to be extra creepy all the time. I love how Jenny’s dazed by Paul’s enthusiasm. Figures that it would actually be 2nd. drat. The last sentence is awesome. Very quotable. And love Paul’s enthusiasm. Passion! He’s in the springtime of his youth! Haha, he is so passionate that I had to make him look like a retarded salamander in panel 2 to take him down a couple notches. I feel the same way when I’m stuck in a car drive with a younger sibling or cousin for more than 1 hour. 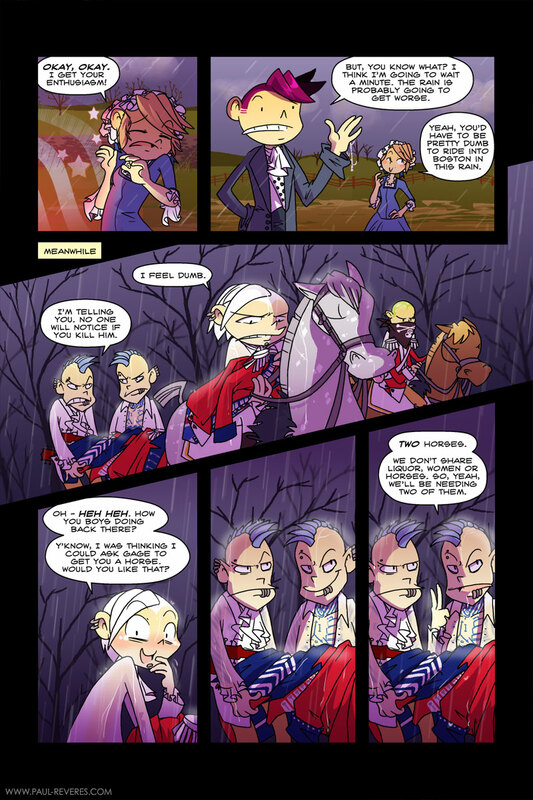 I like how William’s horse has the same expression as him, hehe. I dont know why, but that fourth panel freaks me out. maybe it’s the hair all down in the rain, or the expression, but something makes me think he’s about to kill someone. I swear the twins get some of the best lines in the comic on this page. Its always funny to hear something like “I’m telling you, no one will notice if you kill him” out of context (not that there needs to be much of one).